Not to be confused with General of the Army (United States). The General of the Armies of the United States, or more commonly referred to as General of the Armies (abbreviated as GAS or Gas), is the highest possible rank in the United States Army. The rank is informally equated to that of a six-star general or Generalissimo and is one of the two highest possible operational ranks in the United States Armed Forces. Unofficial Army service uniform shoulder-strap design for the proposed insignia for a General of the Armies. Unofficial proposed rank flag of a General of the Armies. The rank has been held only twice in history – once by an active-duty officer (John J. Pershing), and once by posthumous promotion to George Washington in 1976. The rank of General of the Armies is equivalent to the Admiral of the Navy and is senior to General of the Army, General of the Air Force, and Fleet Admiral. The rank of General of the Armies was intended for bestowal upon George Washington, who held the rank of "General and Commander-in-Chief" which was a grade senior to all American major generals and brigadier generals from the American Revolutionary War. However, only a few months after the Congressional proposal, Washington died on December 14, 1799. The United States Army at that time had also drastically reduced in size and there was no practical need for a superior General rank, thus the proposal for General of the Armies was soon forgotten. In 1865, after the close of the American Civil War, Congress again revisited the idea of a superior General rank. The result was the creation of a special rank called "General of the Army of the United States", which was held by Ulysses S. Grant. This early version of General of the Army was in fact a four-star general officer rank although, unlike in modern times, Congress intended for only one Army officer to hold the position, thus granting the rank the same authority as the initial concept of General of the Armies. William T. Sherman and Philip Sheridan would also hold the position. During Sherman's tenure, the insignia was changed to that of a major general superimposed upon a golden national eagle. The rank of General of the Army of the United States ceased to exist upon the death of Sheridan in 1888. The next proposal to create a superior general rank would occur thirty one years later during the First World War. In the interim, the highest possible general officer rank of the United States Army was that of two-star major general. Within the United States Navy, three- and four-star ranks continued into the 20th century, leading to the creation of the Admiral of the Navy rank in 1899. George Dewey was appointed this rank which, at the time of its creation, was considered a four-star admiral with an added honorary title. A comparison between Admiral of the Navy and General of the Armies was first made in 1944, although the rank of Admiral of the Navy was never declared equal in seniority. During World War I, the United States Congress authorized the appointment of three-star lieutenant generals and four-star generals to be granted temporarily for service in the National Army. Tasker H. Bliss and John J. Pershing were promoted to general in October 1917, and Peyton C. March was promoted to that rank in May 1918. Hunter Liggett and Robert Lee Bullard were both promoted to lieutenant general on October 16, 1918. In 1919, by Congressional directive, the rank of General of the Armies was formally established and John J. Pershing became the first person to hold the rank. After the close of the First World War, the highest active grade in the U.S. Army again became major general, with all lieutenant generals and generals (except for Pershing) reverted to this permanent rank of major general. Pershing then retired from the United States Army on September 13, 1924, and retained his rank on the U.S. Army retirement rolls until his death in 1948. Four-star generals were reauthorized in 1929, starting with Charles Pelot Summerall. Pershing at this time was no longer on active duty, but his rank was regarded as senior to a full general outside the regular promotion tier. Pershing was still living during World War II, although he was over eighty years old. Nevertheless, the question was immediately raised by both the media and the public as to whether Pershing's rank "fit in" with the new five-star position. The situation was touchy from a diplomatic viewpoint, since the five-star General of the Army rank had been created largely to give American officers equal rank with British Army field marshals. The United States government was very hesitant to declare that Pershing held a senior rank to General of the Army, since this would elevate him to six-star status, the same as a grand marshal or generalissimo in Europe and possibly offend not only the British but also the French. Stimson's answer was very carefully worded and nowhere did he ever actually state that Pershing held six-star rank. The situation with Pershing was seemingly solved, but the matter of a six-star general in the United States military would reappear in only a few months during the summer of 1945 at which time Douglas MacArthur was proposed for promotion to General of the Armies. Efforts to promote MacArthur, although never successful, would continue for the next twenty years and lapse only with his death in 1964. The rank of General of the Armies was revisited with a posthumous promotion of George Washington in 1976. In 1981, upon the death of Omar Bradley, brief consideration was given for another posthumous promotion; however, no action was taken beyond designing a potential "modern day" insignia for General of the Armies. The most recent reference to the rank of General of the Armies occurred in 2008 when the Army authorized the Army Service Uniform as the new standard uniform for United States soldiers. As part of the first presentations of the uniform to Army leadership, the Institute of Heraldry created an insignia chart with officer ranks ranging from Second lieutenant to General of the Armies of the United States. This 21st-century insignia chart, showing both a five- and six-star general officer, was considered unofficial by the Army and was later refined to show insignia only to four-star general. John J. Pershing was the only person in history to hold the rank of General of the Armies while serving on active duty. In 1919, to honor his service in World War I, Congress authorized the promotion of Pershing to the rank of "General of the Armies of the United States" and allowed him to design his own insignia. On September 3, 1919, President Woodrow Wilson, in accordance with Public Law 66-45, promoted Pershing to that same rank. The rank was primarily intended to recognize Pershing's performance as commander of the American Expeditionary Forces. General Pershing chose to wear the four stars of a general, but in gold, to signify his new position. A bureaucratic loophole in Army regulations did not recognize this insignia, thus Pershing's gold stars did not appear on Army rank precedence charts and were considered as an unofficial rank insignia. The matter was not resolved until after Pershing's retirement when the Army declared that the four gold stars worn by Pershing were the official insignia for General of the Armies of the United States, thus creating the following hierarchy of Army general-officer ranks. George Washington was the first person considered for the rank of General of the Armies in 1799. He was posthumously promoted in 1976, 177 years after his death. As part of the American bicentennial celebrations, a proposal was raised in Congress to commemorate the leadership and historical importance of George Washington by appointing him to the grade of General of the Armies of the United States. 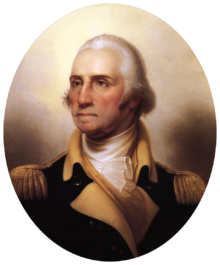 In his own day, Washington had been appointed and served as "General and Commander in chief of the Army of the [United States]". but only wore the three-star insignia of an Army lieutenant general. As of 1782, when Washington was listed as a lieutenant general on the rolls of the United States Army, his rank was informally called "three-star general". The United States at this point had no four-star general rank and would not until 1866. At that time, the European rank of captain general was shortened to simply "general"; there would also be no lieutenant generals in the American army until Winfield Scott was "brevetted" to the rank of lieutenant general in 1855. Since Washington had technically retired as a lieutenant general (three stars), he was as a result outranked by later four and five-star generals and admirals of the Civil War, World War I, and World War II. To rectify this discrepancy, and to acknowledge Washington's unique role in military history as serving as a military commander-in-chief not answerable to either the Continental Congress or its President, Congress in 1976 felt it appropriate that Washington be granted a supreme rank to signify that he actively commanded with complete authority all branches of military forces within the United States. The formal promotion order signed by Secretary of the Army Clifford Alexander, Jr. The formal promotion order signed by Secretary of the Army Clifford Alexander, Jr., simply formalised the promotion. It did not mention six-star status, nor did it include, as the legislation did, the phrasing "such grade to have rank and precedence over all other grades of the Army, past or present". The legislation implicitly clarified the relationship of Washington's rank to Pershing's. Public Law 94-479, which codified the rank of General of the Armies of the United States, did not create a separate rank from Pershing's but rather simply clarified that, while Washington and Pershing held the same rank, Washington was to be considered senior although having obtained the rank at a later date. 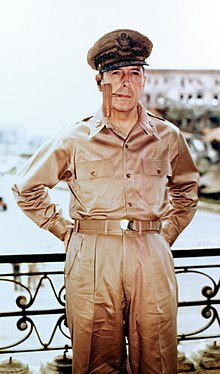 General of the Army Douglas MacArthur was considered for appointment to the rank of General of the Armies both during and after World War II, but a formal promotion order for his appointment "to the office of General of the Armies of the United States" was never issued. Supporters of MacArthur would lobby for over two decades to have the general promoted to "six star general". As part of the preparation for Operation Downfall (the planned invasion of Japan), the United States War Department began drawing up invasion manpower requirements for a large force organized into several Navy fleets and Army groups. The Army also saw the need for a possible promotion of more officers to the rank of General of the Army, depending on the size of the invasion force, as well as the participation of American allies in the Pacific (such as the Royal Navy, Red Army and the Chinese Army) all of which maintained their own equivalents to five-star rank. It became obvious that the Supreme Commander for the attack of Japan would hold an enormous amount of power and would command an invasion force larger than any seen to date in the Second World War. It was also clear that whoever this commander was would have direct command authority of not one, but several five-star officers. To that end, a proposal was discussed in the War Department to appoint Douglas MacArthur to the rank of "General of the Armies" and have this position be considered a six-star general rank. At the beginning of August 1945, a member of MacArthur's staff drew a single sketch of a five star general insignia superimposed in its center with a sixth star of rank. This sketch was the first known design for a "six star general" insignia, but was never seriously considered since, just a few weeks later, the proposal for MacArthur's promotion was dropped. The United States Army formally closed the file on MacArthur's promotion on August 18, 1945, four days after Japan's surrender announcement which rendered the planned invasion of the Japanese home islands unnecessary. MacArthur's service record was then annotated that the promotion package had been closed due to "lack of necessity for such a rank". As this proposal to promote MacArthur was simply "on the drawing board", the United States Army firmly stated for the next twenty years that there was never an officially recognized six-star general rank in the United States military hierarchy. John Pershing's status also remained in a very gray area, in particular because of the vague statements made by Secretary of War, Henry L. Stimson, and the fact that Pershing was never on active duty at the same time as a five-star General of the Army. In 1955, the United States Congress considered a bill authorizing President Dwight D. Eisenhower to promote MacArthur to the rank of General of the Armies. 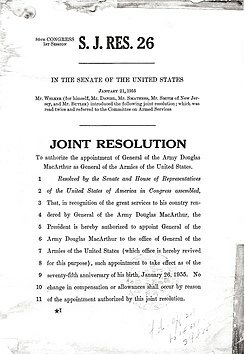 The language used in the bill states that the rank was to be "re-activated" and that MacArthur was to be "promoted" to the position. With such terms, the Congressional legislation all but confirmed that General of the Armies was a senior rank to that of General of the Army. However, the Army itself still did not declare that General of the Armies was a six-star rank, and Congress did not actually pass, or even vote on, the proposed legislation. Because of the various complications, MacArthur advised Dwight Eisenhower that he wished to decline promotion and the bill to promote MacArthur was dropped. Supporters of MacArthur continued with further petitions, however, and the MacArthur Memorial in Norfolk, Virginia possesses numerous letters from 1962 through 1964 attempting to obtain MacArthur a "six-star promotion". In the letters, as well as a congressional record appendix from February 1962 (pages A864-A865), this promotion was referred to as both "six-star general" and "general of the armies". When MacArthur died in 1964, proponents for his promotion petitioned both the Army and Congress to grant a posthumous promotion to General of the Armies, and even went so far as to obtain a vote of neutral support from Harry S. Truman (meaning he would neither support nor attempt to scuttle the promotion). In 1965, the Deputy Chief of Staff for Army Personnel contacted the Institute of Heraldry and requested the feasibility of creating a six star general insignia in the event that MacArthur was in fact posthumously promoted. At the same time, the Army Personnel Office began attempting to resolve the confusion surrounding the status of General of the Armies. The Army Personnel Office determined that, because of the number of living five-star generals still on the Army rolls in 1964, to introduce a rank of General of the Armies would require a formal regulation dealing with seniority, insignia, and retirement benefits. The Army Judge Advocate General also advised that, should MacArthur receive promotion to rank of General of the Armies, salary and benefits associated with the much more firmly established rank of five-star General of the Army would have to be reexamined. The Joint Chiefs of Staff further stated that because George C. Marshall was senior to MacArthur on the Army rolls, that should MacArthur be made a General of the Armies, a similar measure would have to be passed posthumously promoting Marshall as well (Marshall had died in 1959). Due to various logistical and administrative difficulties, as well the United States having recovered from the John F. Kennedy assassination coupled with the expansion of the Vietnam War, efforts to promote MacArthur were ultimately dropped and no further petitions to the Army were received after 1966. 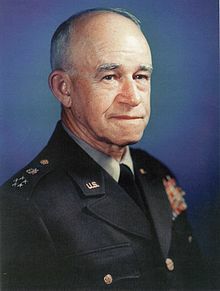 Upon the death of Omar Bradley in 1981, Congress considered a special recognition to commemorate the passing of the last of the Second World War five star officers. Six weeks after Bradley's death, the House Armed Services Committee sent a letter to the Institute of Heraldry and the Army requesting to know the feasibility of promoting Bradley to the rank of six star general. A brief was issued which repeated much of the concerns raised in 1964 when Douglas MacArthur had been considered posthumously for the rank. The Institute of Heraldry released two insignia designs for the rank of the General of the Armies which incorporated a sixth star into the standard five star general design; a third design depicting a six star collar insignia was also proposed. In response to a concern regarding seniority amongst five star officers, Congress also requested clarification as to the procedures should a United States Navy or Air Force officer be promoted to six star rank. The response to Congress stated: "Should an officer of the Air Force or Navy be promoted to six star rank, that officer should be entitled to the six star insignia with a service specific crest". October 1917: John J. Pershing promoted to four-star general, now known simply as "General"
^ "How many U.S. Army five-star generals have there been and who were they?". United States Army Center of Military History. ^ "General of the Armies of the United States and General of the Army of the United States". US Military. About.com. 2016. Retrieved August 17, 2014. ^ a b "Pershing, John, GEN". Together we Served. 2011. Retrieved August 17, 2014. ^ "5 Star Generals". Militaryfactory.com. Retrieved August 14, 2013. ^ a b Cont'l Cong., Commission for General Washington, in 2 Journals of the Continental Congress, 1774-1789 96-7 (Library of Cong. eds., 1905). ^ a b Cont'l Cong., Instructions for General Washington, in 2 Journals of the Continental Congress, 1774-1789 100-1 (Library of Cong. eds., 1905).